In today’s competitive market, business success and innovation are fueled by data. 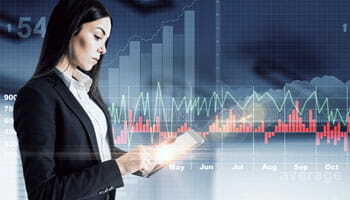 Organizations are harnessing the power of advanced analytics to stoke productivity, boost efficiencies, parse customer preferences, and keep pace with market evolutions. What’s more, data can help business leaders make more informed decisions that can unlock real value. Most business executives view data analytics as a largely technological discipline that is supported by a collection of data-specific processes. That’s understandable, given the technically complex solutions, algorithms, and data-governance capabilities necessary for analytics. But an effective analytics program rethinks the traditional organizational mindset to create a “data culture” in which day-to-day decision-making is based on data. In other words, your people – from top to bottom – are critical to building and sustaining a data-driven culture. C-suite officers should champion the use of data across the organization. In fact, the most successful programs have senior management involvement in data analytics. Leaders should champion the criticality of analytics across business units to encourage the use of data for decision-making. To get there, organizations will need to ensure that data is accessible to all relevant employees at all levels. Similarly, departmental silos of data and analytics tools should be dissolved. And an up-to-date data governance program is critical to providing accurate, clean data for analysis. All this will require continual employee awareness and training, as well as a robust change-management program. What’s typically not needed is homegrown or custom solutions. Too often, organizations try to reinvent the wheel when adopting analytics. That’s often unnecessary because specialized vendors help a company select the right external analytics solutions, and connect them to processes and the third parties best positioned to help deliver on the promises of data. In addition to analytics, many organizations are starting to embrace integrated business planning (IBP) to maximize the value of data and boost performance. IBP is a financial-planning solution that establishes a platform for managing and communicating planning scenarios in real time across departments, such as supply chain and sales, with those of corporate finance. IBP facilitates the automation of data integrity and consolidation. Doing so allows stakeholders to work from a single script to align plans, forecasts, and budgets across the organization. At the enterprise level, IBP helps break down functional silos, cultivate a business culture based on collaboration, and harmonize financial planning across the organization to yield more accurate predictions. The chief benefit of IBP is that it provides a data-driven solution that helps businesses improve the accuracy of forecasts and financial planning. It does so by allowing stakeholders to assess changes in assumptions and dynamically apply revisions in one department’s assumptions to the overall business outlook. It also enables on-demand flex analysis that can be presented in multidimensional views. In addition to more accurate planning, IBP can also enhance operational efficiencies and job satisfaction by enabling teams to focus on the use and value of data, rather than creation of datasets and analytical models. CohnReznick’s data strategy addresses the cultural and collaborative imperatives of data analytics by combining three interlocking pillars: A value-based architecture that aligns data with overall business objectives, an information-centric architecture that aggregates and stores contextualized data in a central repository, and data-governance processes that foster employee accountability. We can help you implement proactive data analytics and IBP solutions, as well as refine your change-management program to help ensure that the technologies are well understood and adopted by users. Organizations that remove silos and foster a data-driven culture will be positioned to achieve strategic and operational efficiencies, quickly adapt to marketplace changes, and achieve competitive differentiation.